Your kitchen is the most important room in your house. It's the hub of your household where family comes together to share meals, neighbors and friends hang out, and kids do their homework. It's also the room that sees the biggest return on investment when it comes to home improvement. Erix Home Improvement LLC has been remodeling Rockville, Maryland kitchens for 7 years. From small makeovers to complete kitchen design and remodeling, Erix Home Improvement LLC's experienced renovation team can turn your kitchen into your families favorite room in the house. Do you need more room in your kitchen? The right cabinets make all the difference when it comes to storage. Erix Home Improvement LLC can help you select cabinets that offer more functionality to make the most of your Rockville kitchen area. Add a custom island to gain counter space, storage for small appliances or pots and pans, and additional seating for casual get-together. Whether your goal is to utilize your existing space or to expand your kitchen area, Erix Home Improvement LLC will design and build a kitchen that works hard and looks great. We've been renovating Rockville, Maryland kitchens since 2012. Out of date appliances, plumbing, or electrical? Update plumbing and electrical, including proper venting, to meet Maryland code. Add a ceiling fan, update light fixtures, add task lighting or under cabinet lighting. Replace existing appliances with energy efficient appliances. Replace existing floor with a lower maintenance version. 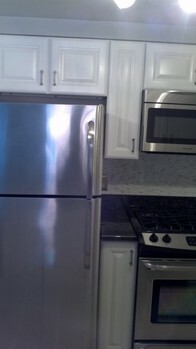 Erix Home Improvement LLC has certified plumbers and electricians to ensure that your kitchen is safe and up to code. Change your color scheme. Paint the walls or the cabinets with a bold color. Erix Home Improvement LLC has 7 years of experience updating kitchens in Rockville, Maryland. Your family may never want to eat out again. 5★★★★★ - "Contractor did an amazing job remodeling my bathroom. Work was done and completed on time and as agreed. A co-worker recommended Erix Home Improvement. She was right, his work is good. I would highly recommend this contractor to anyone who is planning to remodel their home and I will use him for other home improvement jobs"